One of our state’s key economic features in recent years is that the robust job gains have also been joined by strong wage gains. 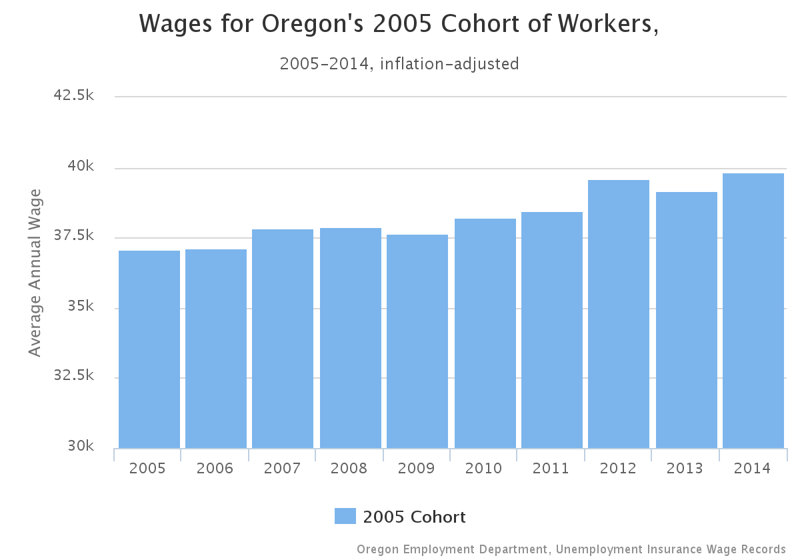 Oregon’s average wage, while still below the national average, is at it’s highest relative point in a generation, or at it’s highest relative point since the mills closed in the 1980s. Oregon is showing signs of a deeper labor market recovery than in the typical state. However, what is driving the wage gains? Is it due to actual wage increases for workers or is it simply the fact that via job polarization we’re adding a lot more high-wage jobs, thus the shifting industrial mix is pulling up the average? The gains are entirely due to workers seeing increases and not the industrial mix shifting. I was surprised at the results as I figured it would be partially due to both. If anything, the industrial mix actually pulls down the statewide average just a hair. Below, the dark blue bars are actual average wages in 2007 and 2014. The light blue bars take the 2014 industrial structure and apply 2007 average wages, and take the 2007 industrial structure and apply 2014 average wages. You can see that the results are nearly identical to the dark blue bars, hence the conclusion that the industrial mix is having a negligible impact on wages. Some really interesting and good data work from Employment’s regional economist Damon Runberg also sheds light on wage gains in Oregon. He set out to see if the data matched the narrative that no, workers are not better off today. Damon started with the workers who reported wages in all 4 quarters in 2005 — over 1.3 million — and tracked those folks over time. One did not have to be continuously employed to be counted — if you lost your job in the recession but began working again in subsequent years, you are counted here. Two-thirds of the original 2005 cohort reported wages in 2014, with an inflation-adjusted median wage gain of 7.5% from 2005 to 2014. That increase is nearly identical to previous cohorts as well that underwent an economic expansion and recession. Of course there are some caveats. By only looking at people who held jobs in the years following 2005, by definition, it ignores those who have been unable to find work or dropped out of the labor force or moved away, and the like. This is considered survivorship bias, where we only track those that “survived” and measure their outcomes and not necessarily the outcomes of the total population. That does not mean it’s not useful, on the contrary I find this research very helpful. Precisely because it focuses on the same people over time. Our office generally compares big aggregates, or totals, over time, so being able to drill down on individual workers is quite useful. Most importantly it does confirm that workers are seeing increases, both in aggregate and at the individual level. Of course not all workers have seen equal gains. Our office focuses on averages since that data is readily available (take total wages and divide by employment) and average gains have been larger than median gains. This is indicative of the skewed income distribution in our country and state. Furthermore, there are other economic and demographic trends that are impacting wage increases as well. Retiring Boomers are being replaced by younger (cheaper) workers, which holds down overall wages. The share of workers reporting no increase in wages in the past year remains higher today than before the recession. And similar to Damon’s work, median hourly earnings for those working nationwide are increasing faster than the more commonly reported average hourly earnings which does not control for the changing mix of workers. 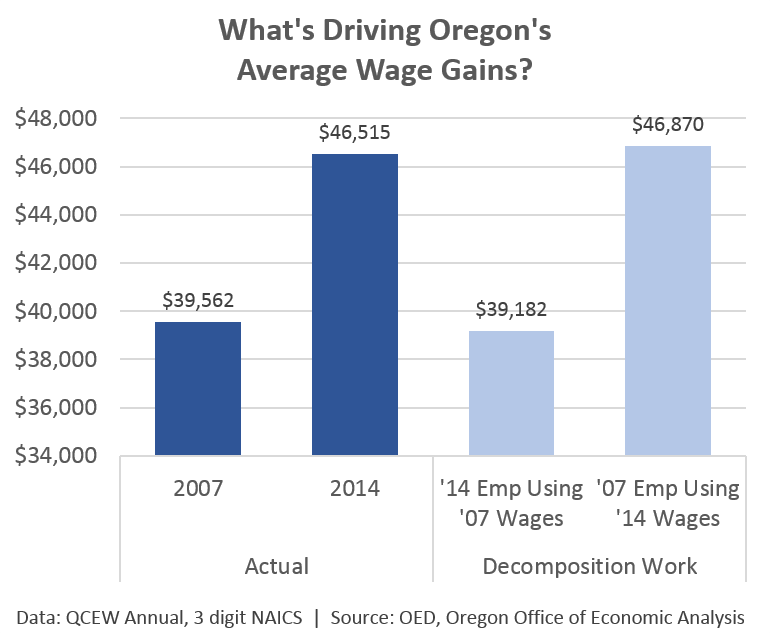 All told, wage gains in Oregon are relatively strong, particularly compared to the nation. It is a great sign and shows a deeper labor market recovery which is needed following the aftermath of the Great Recession.